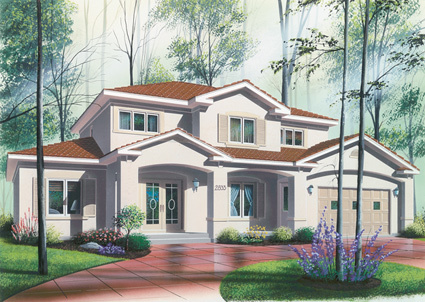 This inviting luxury house plan combines Mediterranean house styling with upscale features. Front and rear covered porches add plenty of usable outdoor living space. The expansive great room adjoins the spacious kitchen, informal eating area, and grand dining room. The media room and den add to the options for entertainment and relaxation. The split-bedroom plan features six bedrooms, four full bathrooms, and a half bath. The secluded master suite features a private bath and walk-in closet, and is separate from the five bedrooms on the second level. This is a very flexible plan, with plenty of exciting options for entertaining guests as well as comfortable privacy. The two-car garage provides storage as well as interior access.